Was developed to meet the requirements of the International Association of Fire Fighters (IAFF) and the International CPAT (Candidate Physical Ability Test), as a tool to aid in the training and testing a candidate’s physical fitness. The 25 pounds vest system simulates the weight of the fire fighter’s protective clothing and equipment. The system also allows for the addition for another 16 pounds. The additional weights are sold separately. Short Maximum System total possible weight is 56 pounds. 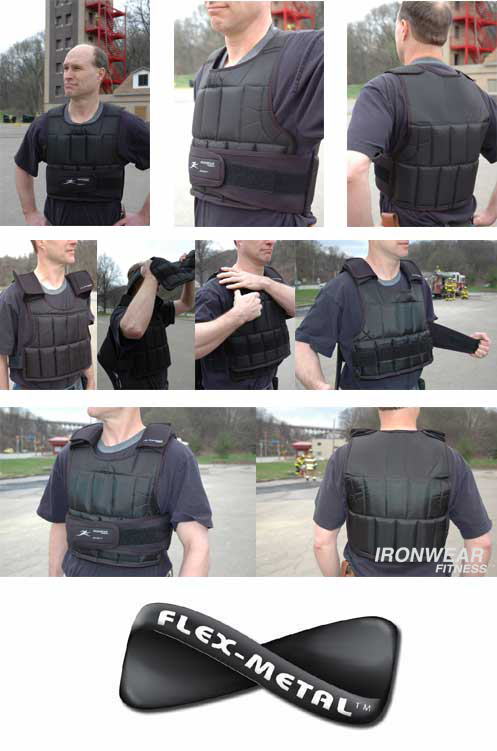 Uni-Vest Max-System™ is used in the training, evaluation, testing of fire fighters. The system simulates the loads and stress that the body must endure with today’s equipment. The system is safer for the trainees than carrying equipment or wearing solid metal bars or plates. It is also safer for the equipment because it avoids possibly risky and unnecessary use. Uni-Vest Max-System™ is the safest weighted vest system available because the system uses IRONWEAR®’s patented soft polymer Flex-Metal® weights. Other weighted vests use solid metal bars and plates which often chafe, bruise and injure the wearer. But IRONWEAR®’s the soft Flex-Metal® weights bend and flex with the wearer and can act as padding in case of a fall. Uni-Vest Max-System™ is the best fitting weighted vest system available because, the soft Flex-Metal® weights bend and conform to the shape of the body, allowing the vest to become one with the body. IRONWEAR®’s patented oversized overlapping elastic strapping system holds the vest securely to almost any size torso while allowing for expansion and contraction of the chest during rigorous exercise. Uni-Vest Max-System™ one size fits both men and women better that any other weighted vest because, the sleek patented compact design has both chest and waist adjustments straps, as well as patented stretch internal pockets which hold the soft Flex-Metal® weights securely on all sides and allows them to bend over the the contours of the torso. The pockets are evenly distributed over the entire vest and the weights can be moved around as needed for maximum comfort and fit. For example, the soft weights can be removed from the chest pockets for additional space and can be move to other locations on the vest to maintain the same weight. Uni-Vest Max-System™ is the least restrictive weighted vest because it does not contain solid metal bars, the whole vest including the soft Flex-Metal® weights, twist and bend with the body’s movements. The shoulder straps have twice the padding of any other vest and are designed not to allow the full range of motion of the wearer’s arms and maximize their reach. Uni-Vest Max-System™ is the most durable weighted vest because of its elegant design. There are no latches to break, pocket flaps to connect or bulging pockets to get caught on. The outer shell is constructed of Bonded Ballistic Nylon with double stitched covered seams for comfort and long life. The inside is constructed of high grade Knitted Padded Nylon for maximum comfort and durability. Uni-Vest Max-System™ is the easiest to maintain weighted vest because it is easy to wash. It can be wiped or hosed off and hung up to dry. IRONWEAR® recommends washing the vest in a shower and hanging it outside in the sun to dry. It can also be machine washed if the weights are removed and the hook and loop fasteners are securely connected first. Uni-Vest Max-System™ has the best warranty and trade-in of any weighted vest. The soft Flex-Metal® weights have a lifetime warranty and the vests have a lifetime defects warranty. Vest shells normally lasts two to ten years depending on the use and care, but IRONWEAR® has a shell replacement plan so that when you wear out a shell you can buy a new shell at half the complete vest replacement price. You simply put your existing weights in the new shell and you have a whole new vest at half the replacement price. Now, after 10 years, IRONWEAR® has just started sending out replacement shells. For example, one training organization that purchased a dozen vests nearly 10 years ago and uses the Uni-Vests™ daily just purchased a new set of shells. The organization now has a new set of vests and only paid half the replacement price. Uni-Vest Max-System™ has a longer and better history than any other weighted vest because IRONWEAR® has been producing the Uni-Vest™ system and soft Flex-Metal® weights for over ten years. IRONWEAR® is the world’s leading supplier of weighted vests and supplies only the highest quality products. Uni-Vest Max-System™ is the best training tool because the multi-layer adjustable design allows the user to train and build up endurance with less weight by first wearing the outer vest loaded to a desired training weight. The wearer can then quickly add the other layer to take the vest to test weight. This can be done easily an quickly in the field and does not require the storing and handling of individual weights. Uni-Vest Max-System™ has training programs for example in one training program weights are moved from the inner to outer vest layer as the trainee’s strength increases. A. Each trainee is given a multi layer vest system loaded with the test amount of weight. The trainer tests the applicant with the vest and determines the amount of weight that trainee should use to start. B. The trainee then transfers the determined training weight to the outer vest and starts training with only the outer vest. C.	As strength increases the trainee moves additional weights from the inner to the outer vest until they are ready to wear both layers. This program has many advantages: each trainee can be challenged according to their ability, the trainee maintains responsibility of all the weights and individual weights are not lost, the complete system is always available for the trainee and trainer to evaluate the trainee’s progress. Uni-Vest™ (short) Professional Outer Vest has 26 unique stretch pockets distributed evenly over the entire vest. Each pocket can accomidate one or two individual ½ pound soft Flex-Metal® weights making the vest adjustable between 1 and 28 pounds. The short system gives you more flexibility that the long system and is ideal where a lot of twisting or bending is required for training and testing. Under-Vest™ (short) Weighted Liner does not have its own strapping system, it connects to the Uni-Vest™ and triples the shoulder padding. The liner has 26 unique stretch pockets distributed evenly over the entire liner. Each pocket can accommodate one or two individual ½+ pound soft Flex-Metal® weights making the liner adjustable between 1 and 28 pounds. The liner makes it safer and simpler to put on and take off than other heavily weighted vests. Put the weight on in layers, then connect the simple attachment flaps and you are ready to go. To take it off, remove the system as one vest or detach the flaps and remove it in layers. Flex-Metal® Weights are made of IRONWEAR®’s patented polymer metal composite. The soft individual inserts are super flexible, thin and flat and do not press into your body like solid metal weights. All the edges are fully rounded, so there are no sharp or hard corners or bulges. Each individual weight insert also has a patented fabric shell to allow it slide into the weight pockets. 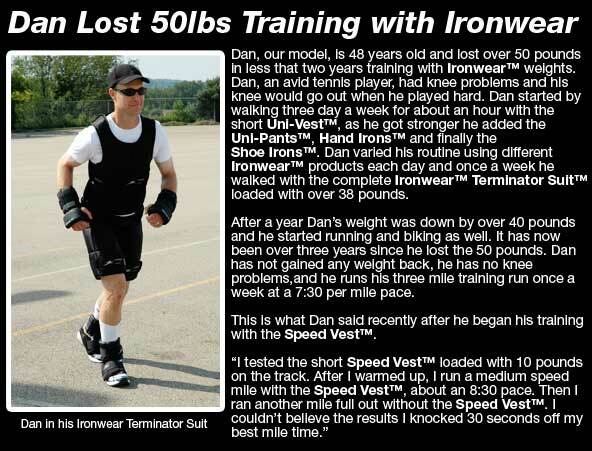 IRONWEAR® challenges you to find a better weighted vest.